X-Small - $40.99 Small - $40.99 Medium - $40.99 Only 8 left! Large - $40.99 Only 2 left! Are you already ready to give your newborn their first costume? How about letting them try out being another species? 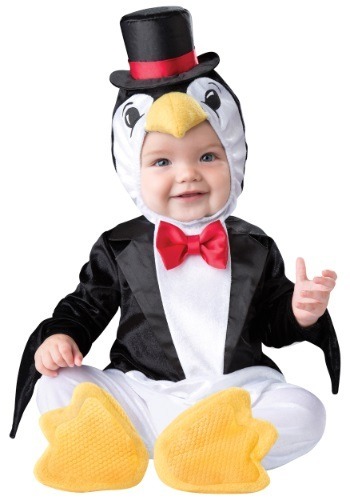 Your baby will be cozy and cute in this infant Playful Penguin costume. With head to toe style in this romper costume, they'll be dapper, dashing, and of course, they'll be 100% penguin-ey! One of our favorite things about these birds of the Antarctic is that their signature feather pattern is strikingly similar to one of the most iconic human looks, the tuxedo! This light hearted costume takes that idea and runs with it by adding a top hat and bow tie. All polyester fabric with polyurethane foam inserts provide just the right feel to this chill look; and with a plush beak, flipper footies, and a comfy flip up hood with character details, your infant will be able to instantly become a delightful high society animal! And the Velcro attachments and snap together bottom means you'll be able to complete their penguin transformation with ease.